Each Tablet Contains: Vitamin A, Copper, Vitamin B1, Manganese, Vitamin B2, Zinc, Vitamin C, Nicotinamide, Vitamin D, Vitamin B6, Vitamin E, Calcium Pantothenate, Calcium, Biotin, Phosphorus, Vitamin B12, Magnesium, Folic acid, Iron. 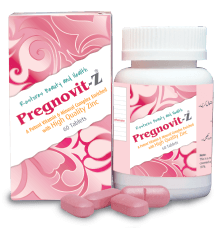 A potent vitamin and mineral complex enriched with high quality Zinc designed to fulfill the needs of postnatal mother. Significantly reduces postnatal depression by regulating nerve impulses. Serves as an anti-oxidant and reduces acne. Promotes collagen formation and makes skin healthy. Repairs and accelerates the hair follicles by regulating oil-secreting glands. *Patients should consult with their physician before taking any medicine.